[174 Pages Report] The global human machine interface market was valued at USD 3.23 billion in 2015 and is expected to reach USD 5.86 billion by 2022, at a CAGR of 9.0% during the forecast period. The base year used for this study is 2015, and the forecast period considered is from 2016 to 2022. Increasing rate of adoption of industrial automation equipment in the manufacturing sector human machine interface market. The industrial internet of things (IIoT) is the application of the Internet of Things (IoT) in manufacturing industry. The IIoT is revolutionizing the manufacturing plants by connecting a wide network of intelligent devices that would increase automation in the plants. IIoT helps in acquiring and generating greater amount of data which requires a platform such as human machine interface market for better visualization of the data. With the help of IIoT, plant floors are increasingly becoming more interconnected and integrated that led transformation of industrial automation into smart automation which enables manufacturers to gain better return on investment (RoI). IIoT further enables user to access data of the most inaccessible areas of the plant anytime with the help of mobile HMIs; this further encourages adoption of advanced HMIs in the plant. In the past decade, with the emergence of smart and connected manufacturing technology, the manufacturing industry has witnessed substantial development in the integration of more advanced HMIs on the plant floor as operator expects HMIs to offer same user experience as of smart phones. Thus, IIoT is transforming the manufacturing operations completely and HMI is the primary tool to enable smart automation to obtain its maximum potential. Thus, market players are developing advanced HMI solutions to obtain the full potential of IIoT and smart automation technology for end-user industries resulting into the growth of the human machine interface market. For instance, In November 2015, Kontron AG launched its latest powerful HMI solution, namely, Kontron Fusion Client that enables IIoT solutions for smart automation. The human machine interface market ecosystem comprises interface manufacturers, system integrators, and distributors. The players involved in the development of HMI systems include ABB Ltd. (Switzerland), Advantech Co., Ltd. (Taiwan), Emersion Electric Co. (U.S.), General Electric Co. (U.S.), Honeywell International Inc. (U.S.), Kontron AG (Germany), Mitsubishi Electric Corporation (Japan), Rockwell Automation, Inc. (U.S.), Schneider Electric SE (France), Siemens AG (Germany), and Yokogawa Electric Corporation (Japan). Most suppliers adopt acquisitions, agreements, product launches, contracts, and expansion as key growth strategies as seen from the recent developments; where will it take the industry in the mid to long term? The hardware segment lead the global human machine interface market in terms of market share in 2015. Hardware segment includes basic HMI, advanced panel-based HMI, and advanced PC-based HMI. The market for advanced panel-based HMI is expected to witness a highest CAGR during the forecast period. Increasing demand of mobile HMIs is driving the growth of the advanced panel-based human machine interface market. In addition, the advanced panel-based HMIs have high demand in industries such as oil and gas, chemical, and energy and power, where critical operations are involved. The industries demand advanced solutions to enhance the visibility of production process. 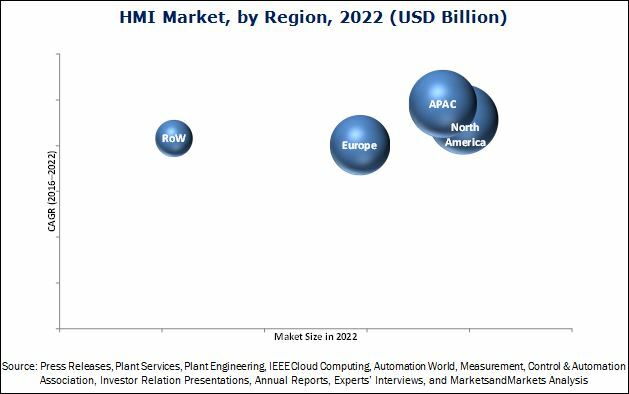 The market for embedded HMI solution is expected to hold a larger market size by 2022 owing to increasing adoption of the embedded HMI solutions in process industry. Embedded platforms enable easy communication between two machines and provide easy access to operators, and thus help operators in process industries to gain more process visibility. The discrete industry dominated the human machine interface market in 2015. Growing need for the monitoring and controlling solutions in automotive, packaging, and aerospace and defense industry is expected to drive this market growth. The automotive industry is expected to hold the largest size of the global human machine interface market for discrete industry between 2016 and 2022. Intensified operation of automotive manufacturing companies to cater the increasing demand for automobiles is expected to drive the demand of the HMI solutions in this industry. North America is expected to lead the overall human machine interface market between 2016 and 2022. Factors such as growth in the discrete industries, high adoption of advanced manufacturing practices, and increasing demand for advanced software solutions in the manufacturing industries are propelling the growth of the market in this region. The human machine interface market in APAC is expected to witness the highest growth rate during the forecast period. Technological innovations in different industries and increasing economic and infrastructure developments in China, Japan, India, and other Southeast Asian countries are the major factors driving the market growth in the APAC region. The key restraining factors for the human machine interface market are high installation cost and complexity involved in the designing of HMI solutions. The key market players such as Rockwell Automation Inc. (U.S.), Schneider Electric SE (France), and Mitsubishi Electric Corporation (Japan) focusing on new product launches and developments, expansion, acquisitions, and collaborations to enhance their product offerings and expand their business. In process industry, the production is an ongoing process or a batch-wise process. The market for HMIs is growing along with the latest developments in the process industry. Increasing use of programmable automation controller (PACs) in process industries such as oil and gas, metals, and mining, food and beverages, and water and wastewater industry is expected to drive the growth of the human machine interface market over the forecast period. The key market players have adopted strategies such as new product launch and development to enhance their capabilities of solution offerings for the process industry. For instance, in November 2015, Honeywell International, Inc. (U.S.) launched latest RTU2020 process controller to efficiently manage complex remote automation and control applications in oil and gas, mining, and other process industries. In May 2015, Siemens AG (Germany) released latest version of power plant control system, namely, PPA-T3000 R7.2 that focuses primarily on human machine interface market (HMI). The human machine interface market is segmented on the basis of discrete industry into automotive, packaging, aerospace and defense, semiconductor and electronics, and medical devices. Manufacturing in discrete industries is often characterized by very high complexity and limited volume or low complexity and high volume. These industries often have individual or separate production units. A discrete product at the end of its lifecycle can be broken down into its components and they can be recycled. Increasing global competition and consumer demand encourages discrete manufacturers to improve their production quality and reduce the operational cost at the same time. Will the suppliers continue to explore new avenues for HMI? Is there a threat from substitute products? 11.2.1.1 New Product Launches and Developments are Expected to Drive Growth of the market in the U.S.
11.3.1.1 Rising Automation in the Food and Beverages Industry is Driving Growth of the Human Machine Interface Market in the U.K.